Open source software has unquestionably gone from fringe idealism to mainstream, even if the average person doesn’t really know it. From their web browser to their smartphone operating system, more people are running open source software today than at any other time in the history of computing, and the numbers are only getting bigger. While we can debate how well some companies are handling their responsibilities to the open source community, overall this is probably a lot closer to an open source utopia that many of us ever believed we’d get. For argument’s sake, let’s say the software is settled. What’s next? Well, if we’ve got all the open source software we could ever ask for, naturally we now need to run it on open source hardware. Just like our software, we want to see how it works, we want to modify it, and to fix it ourselves if we want. These goals are precisely what [Lukas Hartmann] had in mind when he started work on Reform, the latest entry in the world of fully open source laptops. Like the Novena that came before it, the Reform leverages the four-core ARM Cortex-A9 NXP i.MX6 SoC to deliver tablet-level performance, though [Lukas] mentions the design may migrated to the upgraded six-core version of the chip in the future which should give it a little more punch. The SoC is paired with the Vivante GC2000 GPU which can be used under Linux without any binary blobs. Most hardware is connected to the system via the USB 2.0 bus, though networking is provided by a ThinkPenguin mini PCI-e wireless adapter, and on-board SATA handles the 128 GB SSD. While the internals are relatively run-of-the-mill these days, the work that [Lukas] has done on the case and input devices is definitely very impressive. He partnered with industrial designer [Ana Dantas] to get the look and feel of the system down, and built almost everything out of 3D printed parts. 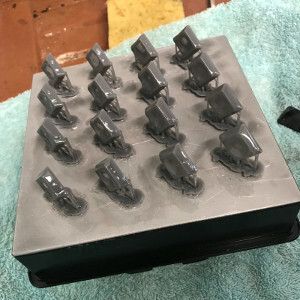 Even the keyboard caps and the trackball were manufactured in house on a Formlabs Form 2. Rather than using an off-the-shelf USB HID solution, [Lukas] is using Teensy LC boards to interface the custom input hardware with the OS. [Lukas] is still working on how and when the Reform will be made available to the public. After some refinements, the team hopes to make both kits and individual parts available, and of course put all the files up so you can build your own if you’ve got the equipment. A mockup Amazon listing for the Reform has been posted to get the public’s feedback on the look and features of the machine, and [Lukas] asks that anyone with comments and suggestions send him an email. Between the Reform, Novena, and the Olimex, competition in the realm of DIY laptops is frankly staggering. Now we just need more people working on open hardware smartphones. Thanks to [Adrian] for the tip. The latest hardware project from [Bunnie] is the Novena, a truly open source laptop where nearly every part has non-NDA’d datasheets. This is the ideal laptop for hardware hacking – it has an FPGA right on the motherboard, a ton of pin headers, and a lot of extras that make interfacing with the outside world easy. While the crowdfunding campaign for the Novena included a completely custom laptop, it was terribly expensive. That’s okay; it’s an heirloom laptop, and this is a DIY laptop anyway. With the Novena now shipping, it’s time for people to build their laptops. [Ben Heck] is the first person to throw his hat into the ring with his own build of the Novena laptop, and it’s fantastic. The second video of the build was dedicated to what is arguably the most important part of any laptop: the keyboard. For the keyboard, [Ben Heck] went all out. It’s a completely mechanical keyboard, with backlit LEDs built around the Phantom PCB with Cherry MX switches. Because this is a DIY laptop and something that is meant to be opened, the keyboard is completely removable. Think of something like the original Compaq luggable, but turned into a laptop that looks reasonably modern. The laptop enclosure was constructed out of a sandwich of an aluminum and laser cut plastic. These layers were glued and screwed together, the parts were carefully mounted into the case. The USB keyboard was attached directly to one of the chips on the motherboard with a few flying wires and hot glue. The finished build is fantastic, even if it is a bit thick. It’s the ultimate hacker’s laptop, with an FPGA, Linux, open source everything, and even a cute little secret compartment for storing tools and cable adapters. A great build from one of the best builders around. Experimenting with embedded Linux used to mean reformatting an old PC, or buying an expensive dev board. In February of 2012, the Raspberry Pi was released, and it has proven to be a game changing platform. According to the Raspberry Pi Foundation, over 3.8 million boards have been sold. 3.8 million translates into a lot of great projects. This week’s Hacklet focuses on some of the best Raspberry Pi projects on Hackaday.io! We start with [richardginus] and the RpiFPV (aka Raspberry Pi First Person View) project. [Richardginus] is trying to build a low latency WiFi streaming camera system for radio-controlled models using a Raspberry Pi and camera. He’s gotten the system down into a respectable 160 milliseconds on the bench, but in the field interference from the 2.4GHz R/C transmitter drives latency way up. To fix this, [Richardginus] is attempting to control the plane over the same WiFi link as the video stream. We’d also recommend checking out some of those “outdated” 72 MHz R/C systems on the used market. Next up is [James McDuffie] and his RPi Holga. Inspired by [Peter’s] Holga camera project, [James] has stuffed a Raspberry Pi model A, a camera module, and a WiFi adapter into a Holga camera body. The result looks like a stock Holga. We saw this camera up close at the Hackaday 10th Anniversary event, and it fooled us – we thought [James] was just a lomography buff. It was only after seeing his pictures that we realized there was a Pi hiding inside that white plastic body! Definitely check out [James’] instructions as he walks through everything from hardware mods to software installation. No Raspberry Pi list would be complete without a cluster or two, so we have [Tobias W.] and his 3 Node Raspberry Pi Cluster. The Raspberry Pi makes for a cheap and efficient platform to experiment with cluster computing. [Tobias] did a bit more than just slap a few Pis on a board and call it a day though. He custom machined an aluminum plate to hold his 3 node cluster. This makes wire management a snap. The Pi’s communicate through a four port Ethernet hub and all run from a single power supply. He even added a key switch, just like on the “old iron” mainframes. [Tobias] has been a bit quiet lately, so if you run into him, tell him we’re looking for an update on that cluster! From [Tim] comes the PIvena, a Raspberry Pi laptop which takes its styling cues from [Bunnie Huang’s] Novena computer. Pivena is a bit smaller though, with a 7” HDMI LCD connected to the Pi. The case is made from laser cut wood and a few 3D printed parts. Everything else is just standard hardware. [Tim] kept the PIvena’s costs down by using a wooden kickstand to hold up the screen rather than Novena’s pneumatic spring system. The base plate of the PIvena includes a grid of mounting holes just like the Novena. There is also plenty of room for batteries to make this a truly portable machine. The end result is a slick setup that would look great at any Hackerspace. We hope [Tim] creates an update to support the new Raspberry Pi B+ boards! Our Raspberry Pi-based alarm clock is chiming the hour, so that’s about it for this episode of the Hacklet! As always, see you next week. Same hack time, same hack channel, bringing you the best of Hackaday.io! Still not too sure how to house your awesome Raspberry Pi B model? Don’t worry, [Timothy Giles] has got you covered! He’s just finished this very sleek open source PIvena case for anyone to use. Why is it called the PIvena? He’s basing it off of [Bunnie’s] Novena project which is a hobby-based open source laptop! For more information you can checkout the recent interview we had with [Bunnie] himself! 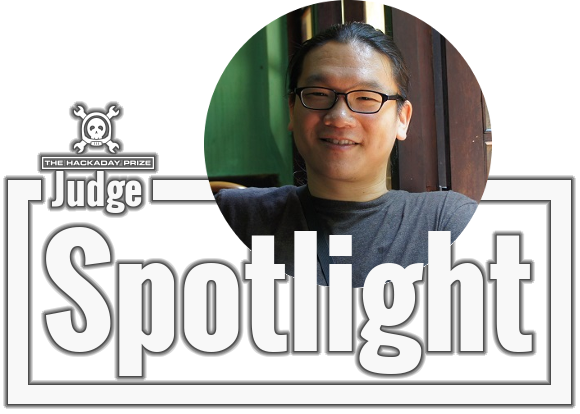 This week’s Judge Spotlight focuses on [Andrew “Bunnie” Huang]. If you haven’t heard of him you need to pay more attention. His hacker cred goes way back to the original Xbox, which he reverse engineered and laid bare its security flaws. Maintaining his hacker spirit he went on to design and hack the Chumby. More recently he took on the challenge of developing and Open laptop called Novena. All of this while continuing to explore and experiment with all kinds of electronics, posting about his adventures for those of us that care about an electronics ecosystem that doesn’t shut out the user from tinkering with the hardware. Join us after the break for our conversation with The Hackaday Prize judge [Bunnie Huang]. We made a point to stop by the Freescale booth at Maker Faire where [Bunnie Huang] was showing off the Novena laptop. His past accolades (Wikipedia page) and the rabid success of the crowd funding round — which nearly tripled its goal — meant we had to make multiple attempts to speak with him. But the third time’s a charm and it was worth the wait! Several things struck me about seeing the hardware in person. First off, I like that there’s a little bit of room inside but the case is still reasonably small. This really is a laptop aimed at hardware hacking; I would anticipate that the majority of backers intend to roll their own hardware for it. Second, [Bunnie] showed off several expansion boards as examples which use a standard 80-pin header to get at the onboard components. The example of a man-in-the-middle attack for the flash chip on a thumb drive was extremely tasty. But it was also interesting to hear about an SDR board which will ship to original backers since the campaign made its stretch goals. If you don’t know much about this project, you can get some background from our post when the crowd funding went live. Open design info is available from the Novena page. Now that [Bunnie]’s open hardware laptop – the Novena – is wrapping up its crowdfunding campaign, it only makes sense that development around the Novena project would move over to the more interesting aspects of a completely hackable laptop. The Novena has a huge FPGA on board, with 2 Gbit of very fast memory hanging off it. Also, every single signal pin of the FPGA is broken out on high-speed connectors, making for some very, very interesting possible add-on boards. [Bunnie] has always wanted a portable, high-end oscilloscope to carry with him, and with the new oscope module, he has something that blows out of the water every scope priced below a thousand dollars. The oscilloscope module [Bunnie] is working on has either two 8-bit channels at 1 GSPS or one 8-bit channel at 2 GSPS with an analog bandwidth of up to 900MHz. The module also has 10 digital channels, so if you need a logic analyzer, there you go. Being a fairly high-end scope, the hardest part of engineering this scope is the probes. The probes for fast, high-end scopes cost hundreds of dollars by themselves, so [Bunnie] looked for a clean-sheet redesign of the lowly oscope probe. To connect the probe to the module, [Bunnie] realized a SATA cable would be a great solution; they’re high bandwidth, support signals in the GHz range, and are rated for thousands of insertions. These active probes can be combined with a number of front ends for application specific probes – digital probes, ones for power signature analysis, and ones for capturing signals across small loops of wire. The module itself isn’t quite ready for production yet, but by the time the Novena crowdfunding campaign starts shipping, [Bunnie] will probably be working on the next add-on module for his crazy awesome laptop. zxy liked ZeroBot - Raspberry Pi Zero FPV Robot . zxy liked ESP32 WiFi Robot. Raphael Schaaf wrote a reply on DIY Knit.